Bombay Mahim Halwa is a famous Indian sweet. Its delicious and mouthwatering sweet.This halwa is like thin delicate slab of sweet decorated with nuts and cardamon.Each slab is separated by butter paper. Usually this halwa comes into two colour white and yellow. 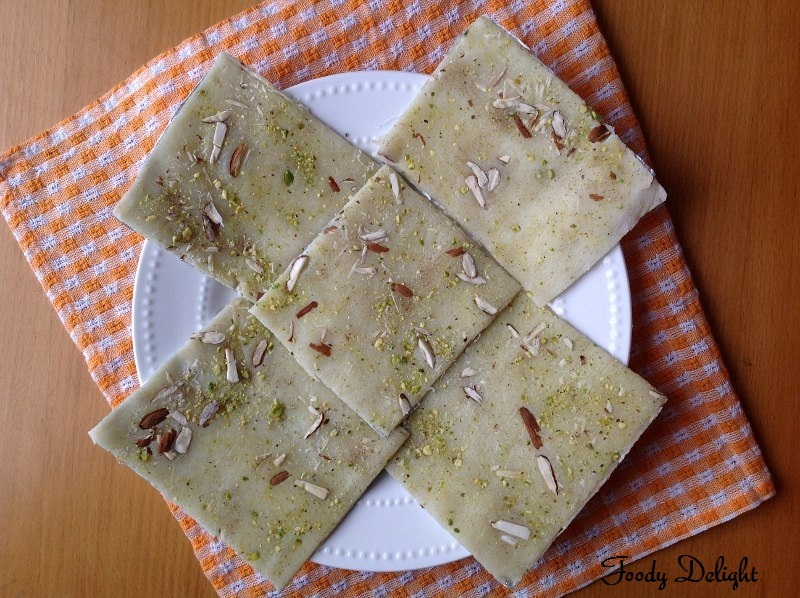 Mahim halwa is also a known as Ice halwa or Paper halwa in Gujarat. Crush the cardamom powder ,chop the almonds and slice the pistchios.Keep them aside. Grease the one side of the silver foil and keep it ready for later use. Mix rava, 3 tbsp of ghee, milk and sugar in a large heavy pan. Place on high flame and stir continuously. Bring the mixture to boil and at some point the mixture will start to get thick. Reduce the flame and add few drops of rose essence and remaining ghee. Now stir the mixture continuously till the mixture leaves the sides of the pan and becomes a very soft dough. When done ,turn off the flame and transfer the mixture onto the greased silver foil. Again place the plastic sheet on the mixture and reroll the mixture very lightly,so that the toppings get sticks into the mixture. 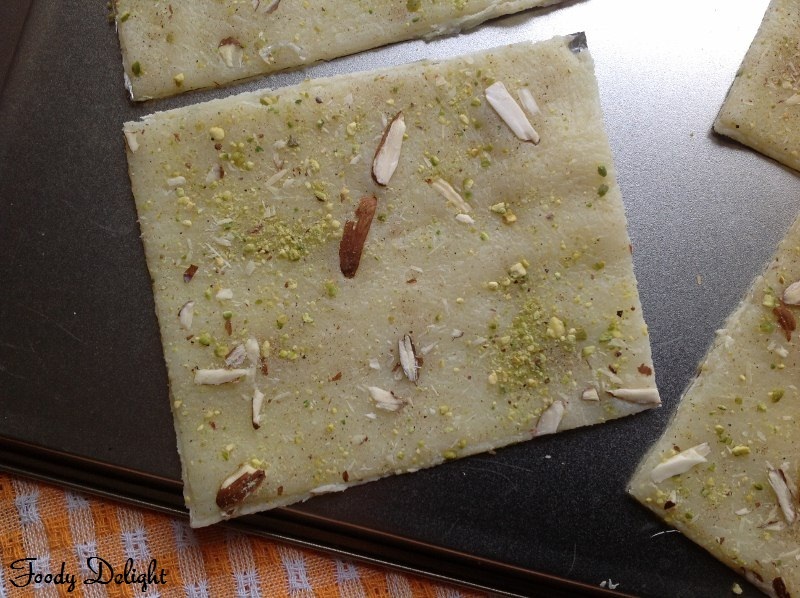 When the halwa slices dries out on one side, flip it onto the other sides. When dries completely .Store it in the airtight container (Place the butter paper or wax paper between the slices to avoid sticking). 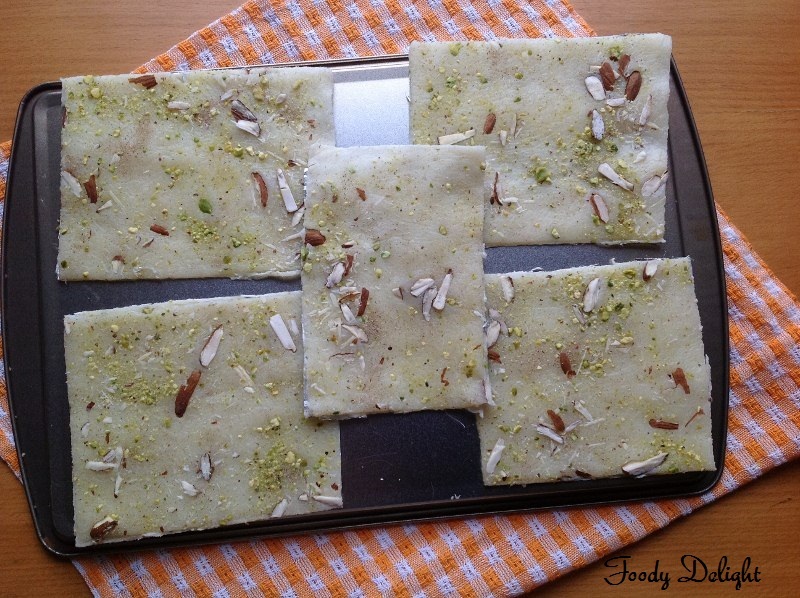 Wow this halwa i know is famous in Mumbai,as I am from Mumbai,great job to make it at home :) very nice recipe. Never had this halwa,but heard lot about it..super delicious halwa. intersting n yummy halwa,new to me,Thanx for sharing Pranjali!! 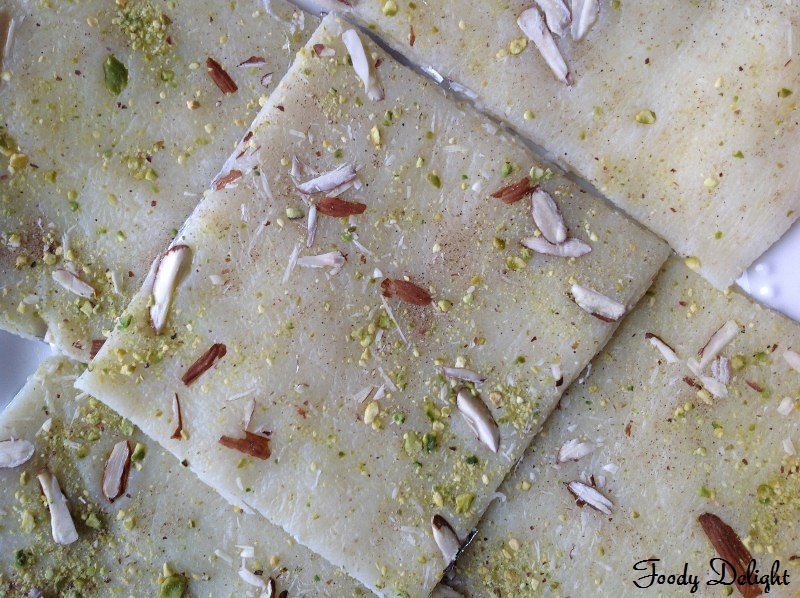 Never had this halwa before but looks very delicious and interesting..bookmarked..